Mom, I was cleaning out my wallet the other day and I found a whole little wad of IOU’s; some of them date back 64 years! I have kept them as a reminder of my debt, even though I know they can never be repaid. All of these IOU’s are owed to one person... YOU. •	IOU for cleaning services: house, clothes, yard, hair, ears and fingernails—and, for drying tears and ironing out problems. •	IOU for medical services: treating skinned knees, cut lips, smashed fingers, the Summer flu, and taking me to the hospital with dust pneumonia. •	IOU for veterinary services including feeding and doctoring numerous dogs and cats (and a chicken named Lazarus!) while I learned respect for all living things. •	IOU for carrying charges—not only for the necessities, but also for toys and trinkets that were important at the time. For doing without so you could buy something better for me, but never letting me know. For making me think my “farm work” was enough to earn my allowance, and to finance a college education. •	IOU for spiritual development. For teaching the basics and answering the hard questions, about God. Then, for doing the best you could to put me on my own by asking me for my thoughts and opinions about spiritual things. •	IOU for entertainment. For reading to me until I was hooked on reading myself—for life; for music lessons; for planning memorable experiences and enjoying them with us; for seeing the things I was interested in and making sure I could have my own experiences. •	IOU for construction work; for building a model of a faithful marriage, the foundation of a family, and for cementing us all together. For always providing shelter in a storm, and room for everyone to grow. •	IOU for appreciating your own family heritage, for teaching me to treat my elders with respect, and for making an adopted child something special in our family. •	IOU for friends and friendships, and teaching me to treat my fellow man with tolerance and understanding regardless of their language, religion, education or economic status. •	IOU for preparing me (at least to some degree) for taking a wife—for helping me understand the importance of sharing the loads of a marriage. •	IOU for not giving up on me when I waited almost 30 years to find Avalyn! Then, for loving her just as you loved me. •	What it means to be a wanted child, for I was adopted. •	Not to demand blind obedience from your children. •	To open our hearts and our homes not only to familiar faces, but to new faces as well. Daddy and Mother both loved people. •	The joy of trying to provide for your children things they think are important. I could be happily dressed in clothes she had sewn, but she would buy an expensive manufactured belt, because I thought I needed one. •	Things don’t have to be perfect to be enjoyed. In an old farm house with loosened wallpaper she would set our table with her best dishes and original place cards to make a special dinner. No one noticed the wallpaper. •	How to make apple dumplings; her’s were the best! •	We must give people the benefit of the doubt; even Christians are not born full-grown and need understanding and time to grown. •	There are other versions of the Bible than the King James, and other commentaries besides Johnson’s; there are other ways of looking at things and new ways to learn. •	To be open to new experiences with enthusiasm; to meet changes in our lives as new opportunities. •	How to give loving care to family, friends and strangers. •	In bookkeeping and in life: you don’t go to bed until your errors are found and your books balanced. •	To value God’s Word. I use and treasure several of her well-used Bibles. They are filled with her notes, questions and important underlines and exclamation marks that mark the things she wanted to add to her life.... she is still teaching me. God blessed me greatly when he selected her for my Mother. I found this little creation only recently, carefully folded in a small square box, and saved among Mother’s most treasured keepsakes… I would guess it was presented about 1940; I would have been 10 and Barbara 8. We undoubtedly picked the wild flowers in the mesquite brush area in front of our farm home, because we certainly didn’t have any flower beds! 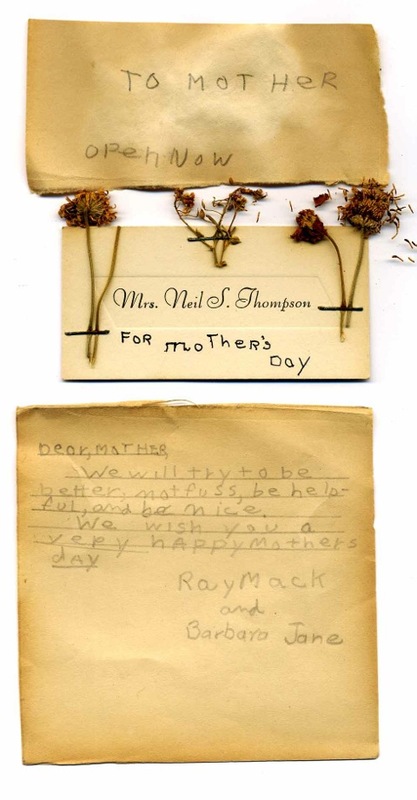 I can just see sis and I using one of Mother’s cards at her desk, stapling the flowers—and they survived long enough for me to scan them! Wonderful memories of the most important person in my life….